(Photo: REUTERS / SANA / Handout via Reuters)Syrian President Bashar al-Assad (R) visits St.Takla Monastery in Maaloula town, northeast of Damascus April 20, 2014, in this handout photograph released by Syria's national news agency SANA. Assad on Sunday visited Maaloula, an ancient Christian town recaptured from rebels last week, state media said, as he seeks to persuade minorities that the government is their best protection against hardline Islamists. Assad's Easter visit to Maaloula - a rare appearance outside central Damascus - also highlighted growing government confidence in recent gains against insurgents around the capital and along the Lebanese border. MAALOULA, Syria (Reuters) - Syrian President Bashar al-Assad on Sunday visited an ancient Christian town recaptured from rebels last week, state media said, as he seeks to persuade minorities that the government is their best protection against hardline Islamists. Assad's Easter visit to Maaloula - a rare appearance outside central Damascus - also highlighted growing government confidence in recent gains against insurgents around the capital and along the Lebanese border. Islamist fighters, including some from the al Qaeda-linked Nusra Front, had taken over part of Maaloula in December and held several nuns captive until releasing them in March in a prisoner-exchange deal. On Monday, government forces retook the town, which is roughly 60 km (40 miles) north of Damascus and has changed hands multiple times, the latest in a series of advances against rebels in the Qalamoun mountains region. During his visit, Assad inspected Mar Sarkis - a Greek Orthodox monastery dating to the fourth century - and damage caused "at the hands of terrorists," state news agency SANA said, using the government's customary term for the rebels. The agency said he also visited the Mar Thecla monastery, which also suffered damage during fighting for the town. 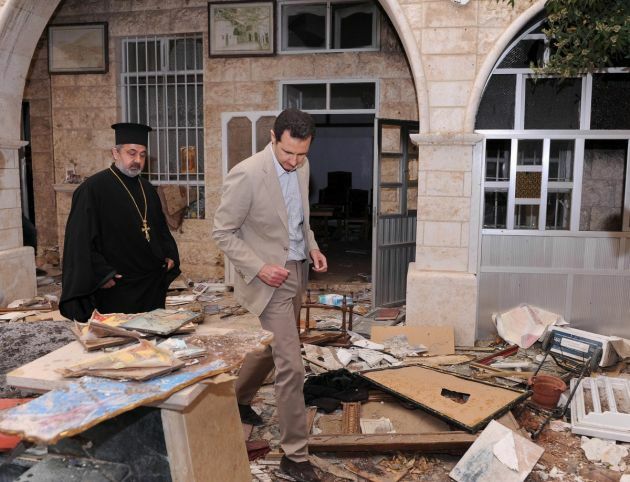 Images published by SANA showed Assad, dressed in a beige blazer, waving and examining antiquities as he toured the area with church officials. A Reuters reporter in Maaloula on a state-organised tour said Syrian soldiers and members of the loyalist National Defence Force militia were stationed throughout the town, where homes and buildings were burned and damaged by the fighting. "The display of hatred was clear - the houses are totally destroyed, the whole village was destroyed. I can't describe the amount of damage to the village," said Lorain, a Maaloula resident in her 20s who was returning on Sunday after fleeing the fighting several months ago. Rita, another resident, said she hoped to return to live in the village but that electricity and water were not ready yet. "Still, we're happy - and we'll be even happier when those who are being held captive are released," she said, referring to residents who are still missing. Syrian Tourism Minister Bishr Yazigi told Reuters that damage and theft to antiquities during the fighting amounted to "billions of Syrian pounds" in losses. Assad's government has consistently tried to portray itself as the protector of the country's minorities, including the Christians who account for about 10 percent of the population. Assad is a member of the Alawite minority, an off-shoot of Shi'ite Islam, while the rebels fighting to overthrow him are overwhelmingly Sunni. Hardline Islamists, many of whom view Alawites as heretics, have been among the most determined rebel fighters trying to overthrow Assad, and have attracted support from opponents of Assad including from Sunni Gulf Arab countries. Shi'ite power Iran is one of Assad's main backers.